The developers of FireChat have unveiled a new version of the app that gained popularity after protests in Iraq and Hong Kong. It allows users not only to communicate in a public chat but also to exchange private messages offline. This year the number of FireChat users exceeded 5 million people, and its developers at Open Garden have ambitious plans to raise that figure to 5 billion. Until recently, the messaging app made it possible to communicate in group chats open to everyone, but the new FireChat will allow users to exchange private messages. The offline messenger that operates without Internet connection or mobile signal became popular thanks to civil protests. The idea of the FireChat app first came in 2001 to Stanislav Shalunov, a graduate of the Moscow State University’s Faculty of Mechanics and Mathematics. The idea became feasible, however, only with the spread of Bluetooth, a service that is on all the time and that has more than one radio channel. In 2011 in San Francisco, Stanislav co-founded Open Garden together with Micha Benoliel, the programmer behind Skype monetization (calls on the basis of the Digitrad VoIP platform), and with Greg Hazel, who supervised the development of BitTorrent client Utorrent, and with systems architect Taylor Ongaro. The seed capital of $100,000 came from Benoliel himself. 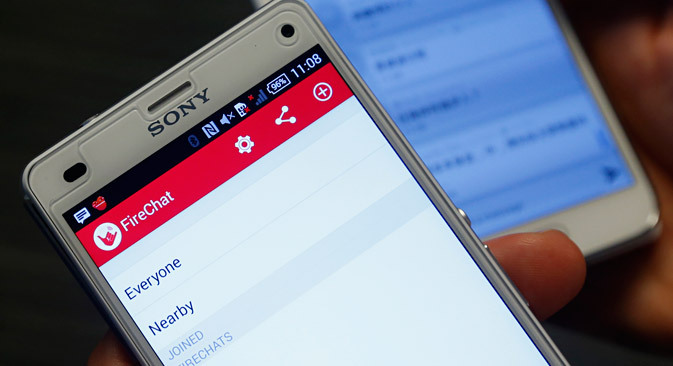 The first to appreciate FireChat were protestors in Taiwan, who in March 2014 took to the streets to speak up against the signing of a trade agreement with China. It then became popular in Iraq, where the authorities restricted access to social networks as a way of countering the spread of radical Islam. The use of the app peaked during the Hong Kong protests in September 2014. It was then in the Google Play store for Android smartphones that FireChat made it into the “from 500,000 to 1 million” users category. The app’s user base grew further thanks to protests in Moscow, and signal disruption in Paris after the Charlie Hebdo attack. The developers are now trying to shed the image of the app as a revolutionary tool . “Indeed, FireChat became popular thanks to various protests around the world. But I see it as my task to get rid of this revolutionary subtext,” said Anton Merkulov, the Open Garden rep in Moscow. In order to communicate via FireChat, users must be within 60 metersof each other. This allows them to create a peer-to-peer mesh network, i.e. their own communication network. Inside it, messages are sent from user to user. FireChat makes it possible to exchange text messages and pictures. In the future, developers hope it will be able to transmit voice and video too. Competition or a solution for mobile operators? Open Garden will now focus on boosting daily use of FireChat. The top four countries where it's most popular are the USA, Hong Kong, India, and Russia. Anton Merkulov points out that the company is now mostly interested in developing countries, where there are still areas with patchy cellular coverage. Open Garden does not view mobile operators as competition. “On the contrary, we are a solution for mobile operators because we promote a rise in smartphone ownership,” said Merkulov. According to experts, one of FireChat's weaknesses is security. For example, a Finnish expert in cybersecurity, Mikko Hypponen of F-Secure Corporation, told the Slush conference in November 2014 that some of the messages during the unrest in Hong Kong were sent to the protesters by the Chinese government in order to identify the organizers. However, according to the developers, registration does not require data that would make it possible to identify users. In addition, FireChat has an in-built algorithm that makes it possible to control any technical interference with the system, including spamming. Open Garden has already presented a prototype of a personal server, GreenStone, the size of a key ring, which will make it possible to store and send messages via FireChat. The developers are convinced that it will make the app even more reliable.